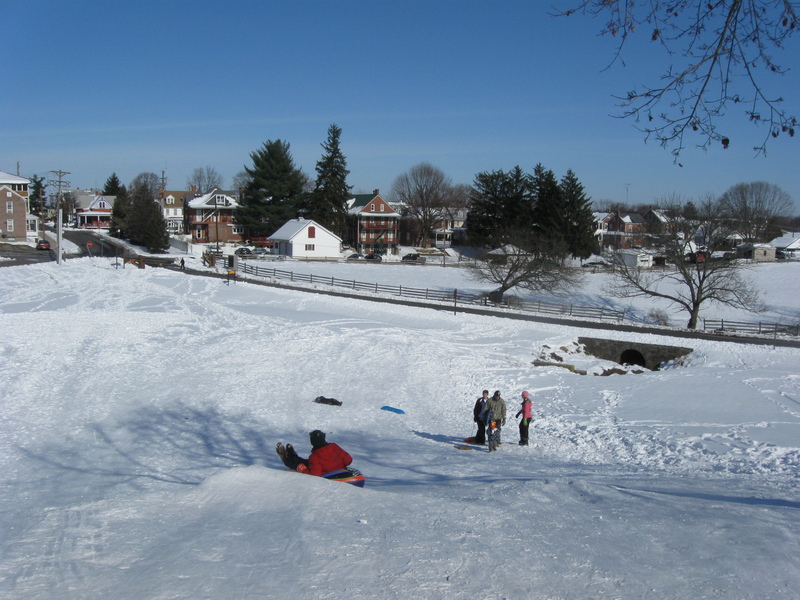 The east slope of Seminary Ridge has historically been a frequently used area for Gettysburg’s sledders (old and young). 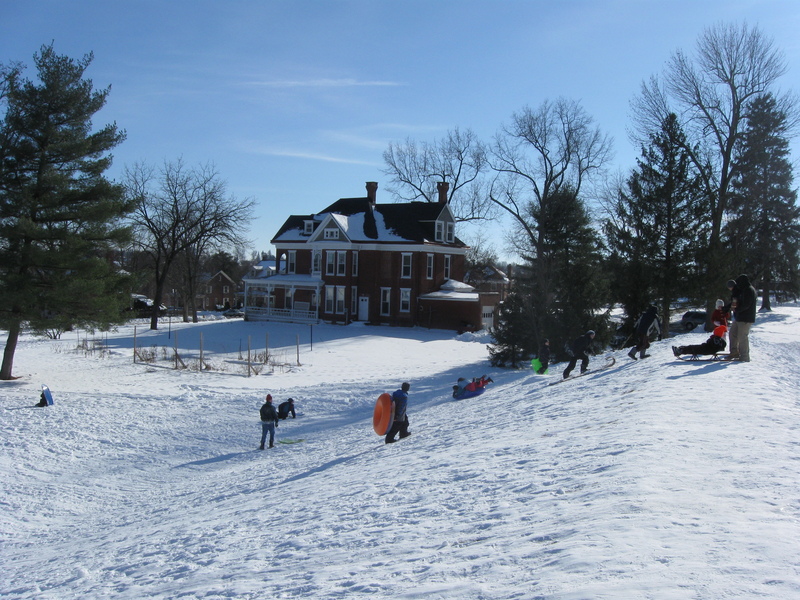 Sledders used to fly down the slope from the steps of Schmucker Hall, shown in the center of this scene) to Hay Street where the photographer is located. 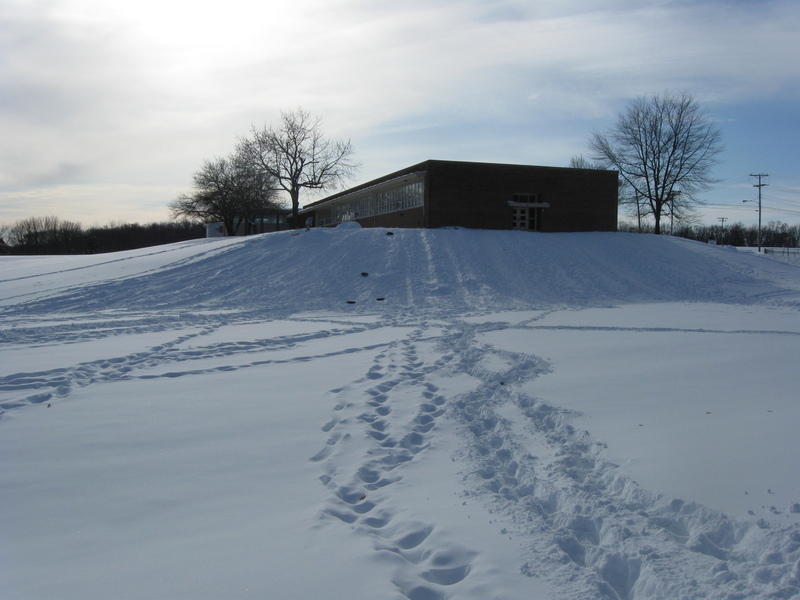 As we will show you a little later in this post, landscape changes have moved the sledding area to the building shown in the left background, Valentine Hall. This view was taken facing west at approximately 11:00 AM on Sunday, December 20, 2009. All students of the Campaign of Gettysburg appreciate the “high ground” and its importance to the battle. 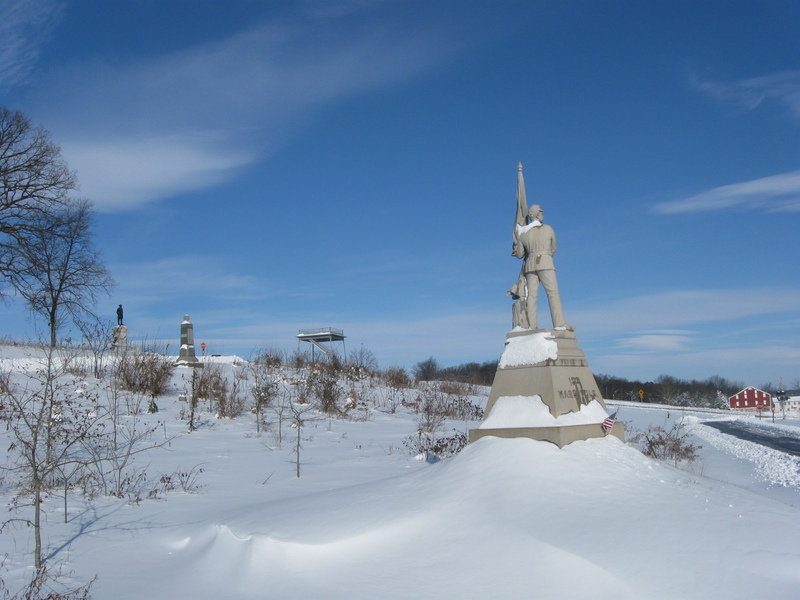 During the warmer months, those students of the battle stand on the elevated positions to get a better understanding of the events that transpired in 1863. When snow makes its appearance, however, other students appreciate the high ground for different reasons. 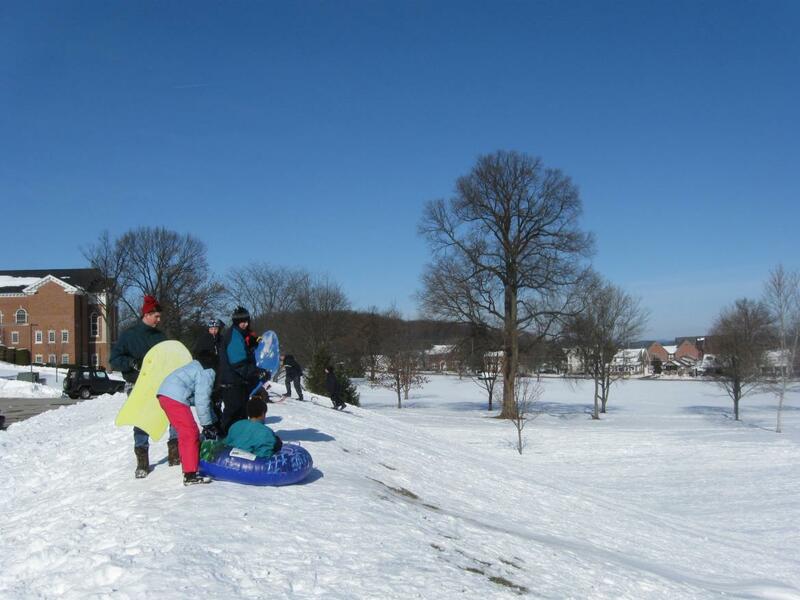 Today we will show you three sledding areas that have been popular with those students. 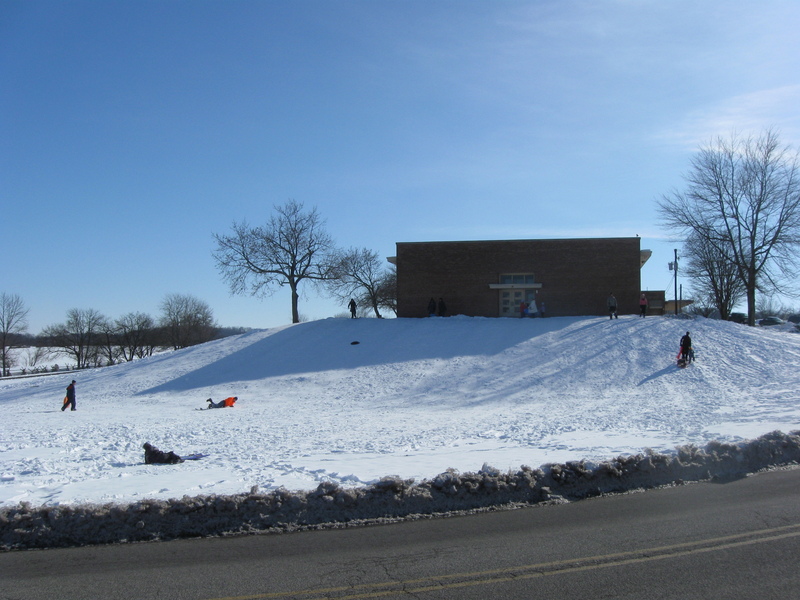 Our first sledding area is the old Keefauver Elementary School. It is located southeast of the center of the borough on Lefever Street. 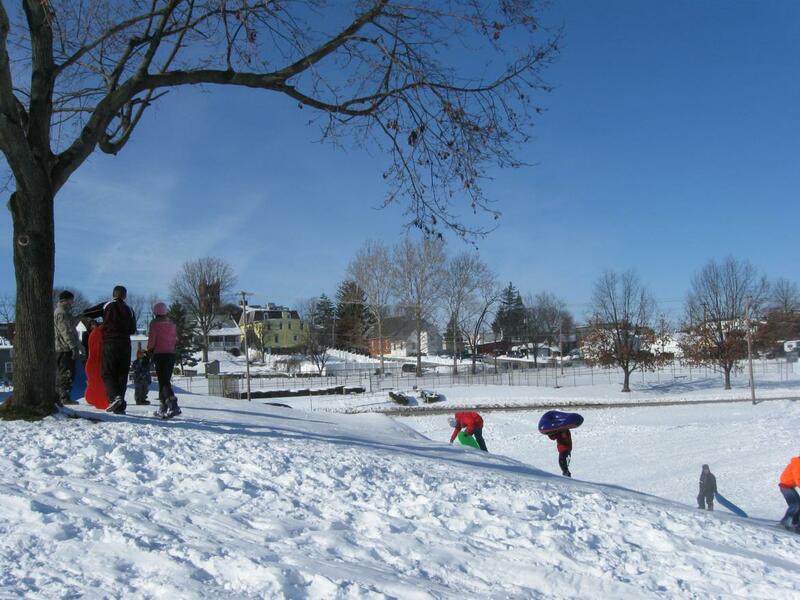 The sledding areas we will show you have a couple of things in common. They are all within walking distance of neighborhoods, and/or they have parking areas for parents to drop off the youngsters and their sleds. This view was taken facing east at approximately 12:00 PM on Thursday, December 24, 2009. 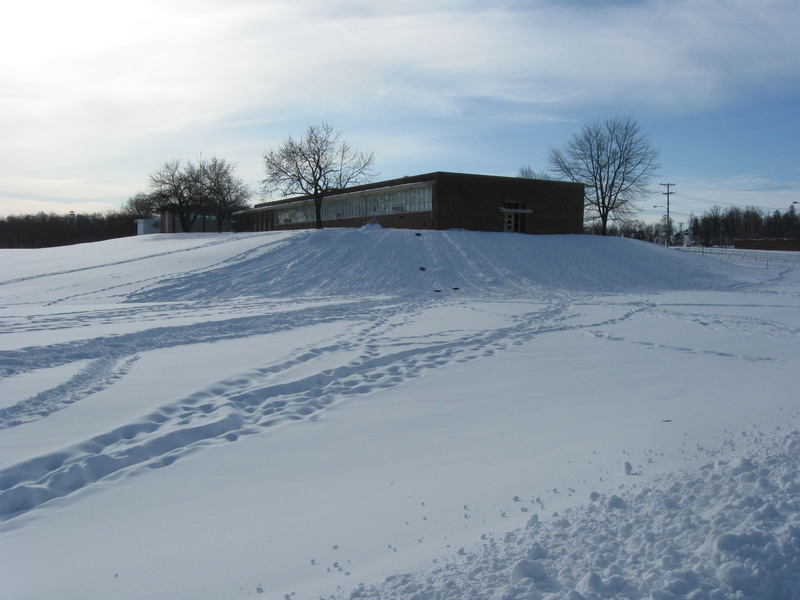 The hill upon which the school building sits has sledding areas on the north and east sides. This view was taken facing south at approximately 12:00 PM on Thursday, December 24, 2009. On the evening of July 2, 1863, Confederates from North Carolina and Louisiana charged over this little hill towards East Cemetery Hill in the right background. 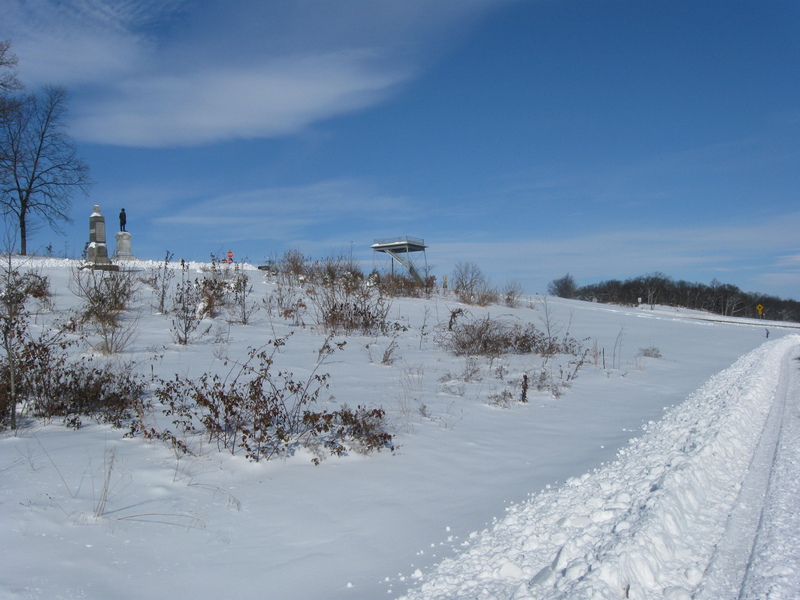 The observation tower on Culp’s Hill is visible in the left background. In 1863 Winebrenner’s Run was visible at the bottom of this slope. 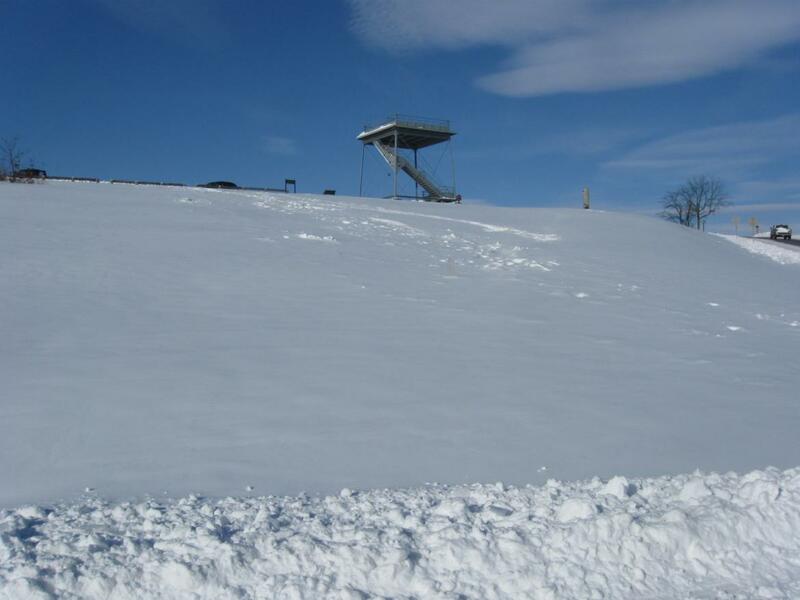 Since it was covered over, and was no longer an obstacle, this became a popular sledding area. This view was taken facing southwest at approximately 12:00 PM on Thursday, December 24, 2009. Private Benjamin Ruch of the 153rd Pennsylvania, a prisoner in the German Reformed Church had been captured during the fighting of July 1, 1863. This view was taken facing northwest at approximately at approximately 12:00 PM on Thursday, December 24, 2008. From the cupola of the church (this is a more modern observation area) he watched the Louisianans advance out of Winebrenner’s Run towards East Cemetery Hill… This view was taken facing northwest at approximately 12:00 PM on Thursday, December 24, 2009. “The Johnnies started stooped over, scattered like a drove of sheep, till they reached the ridge. Then every man took his place, and giving the Rebel yell; by this time our grape and canister began to plow gaps through their ranks. They closed up like water, and advanced on the double quick… To see grape and canister cut gaps through the ranks looks rough. I could see heads, arms, and legs flying amidst the dust and smoke… it reminded me much of a wagon load of pumpkins drawn up a hill, and the end gate coming out, and the pumpkins rolling and bounding down the hill.” This view was taken facing southwest at approximately 12:00 PM on Thursday, December 24, 2009. Now an observer from the Trinity United Church of Christ (as it is now known), shown through the tree branches in the left background, can see different bodies going down the hill. This view was taken facing northwest at approximately 12:00 PM on Thursday, December 24, 2009. 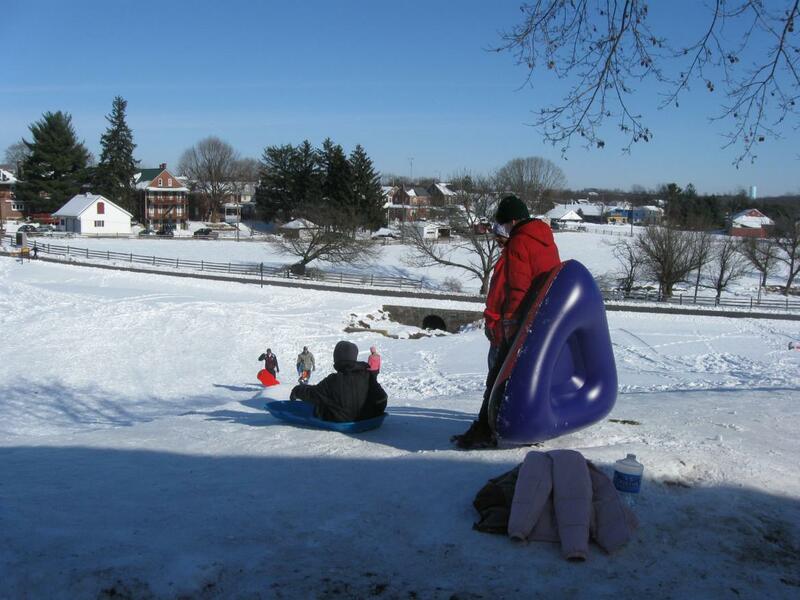 These sledders choose to go down the north side of the hill. The buildings in the left background and center background are located along East Middle Street. The light green/blue water tank marking the site of Camp Letterman (Hospital Hill) is in the right background. Below the water tank is the red barn on the Henry Culp Farm. 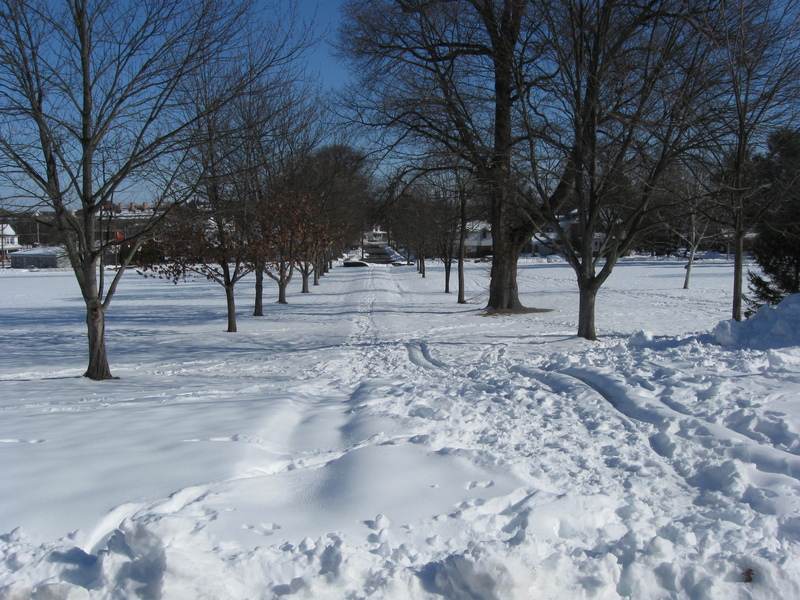 This view was taken facing northeast at approximately 12:00 PM on Thursday, December 24, 2009. The culvert where Winebrenner Run is now located is shown on the right where it runs under East Confederate Avenue towards the Henry Culp Farm and eventually to Rock Creek. 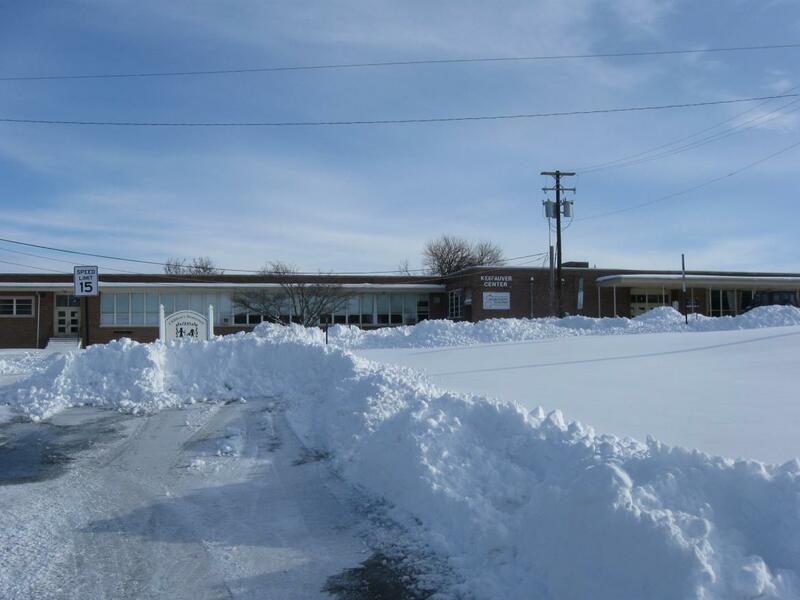 This view was taken facing northeast at approximately 12:00 PM on Thursday, December 24, 2009. In Video #1 the sledder on the blow up raft goes down pretty fast. This view was taken facing southeast to east at approximately 12:00 PM on Thursday, December 24, 2009. 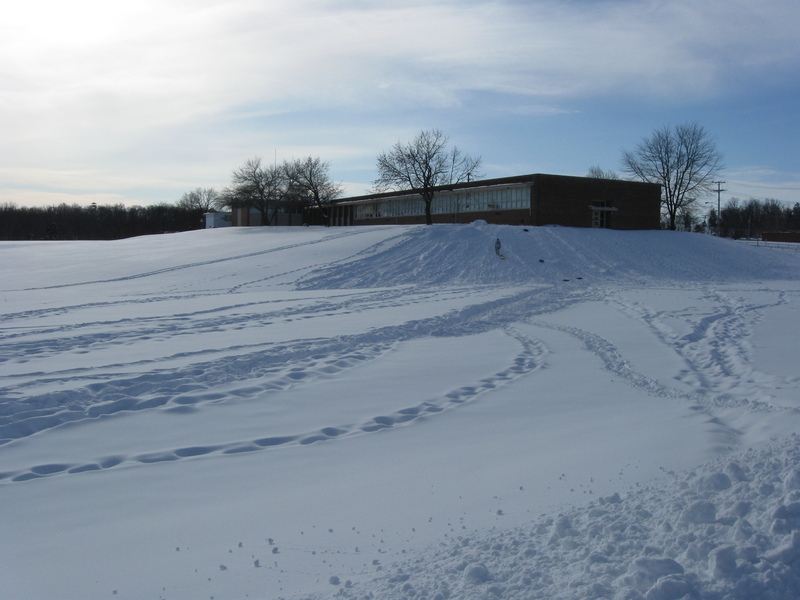 The sledding is pretty good on the north side of the building, but it’s pretty safe as nobody reaches Lefever Street, shown in the foreground. This view was taken facing south at approximately 12:00 PM on Thursday, December 24, 2009. In Video #2 listen to the laughter of the young sledder on the far right. He looked to be about two or three years old. This view was taken facing south at approximately 12:00 PM on Thursday, December 24, 2009. 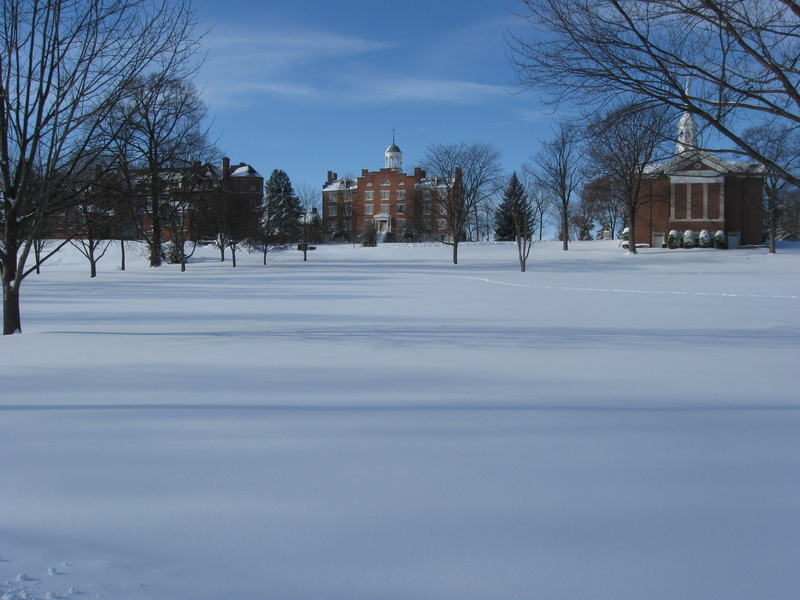 We’ve now moved to Seminary Ridge. 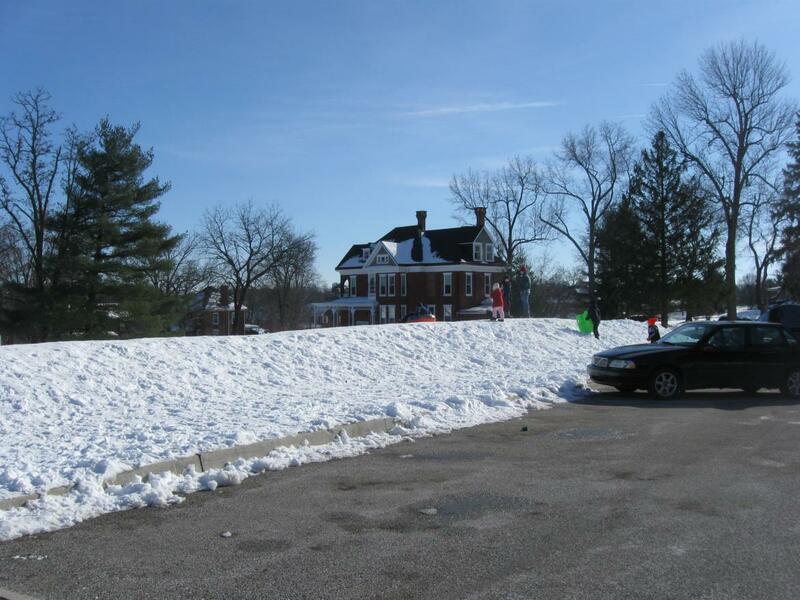 As we mentioned in the first picture, the sledders don’t use the slope beginning at the steps of Schmucker Hall anymore. 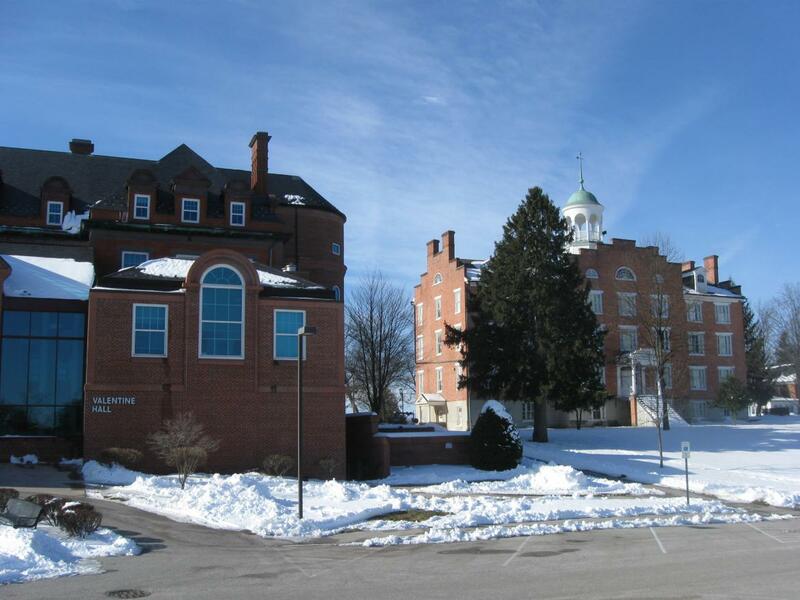 They use the slope in front of the building on the left, Valentine Hall. This view was taken facing northwest at approximately at approximately 12:00 PM on Thursday, December 24, 2008. A few years ago a parking lot was constructed here, east of Valentine Hall. 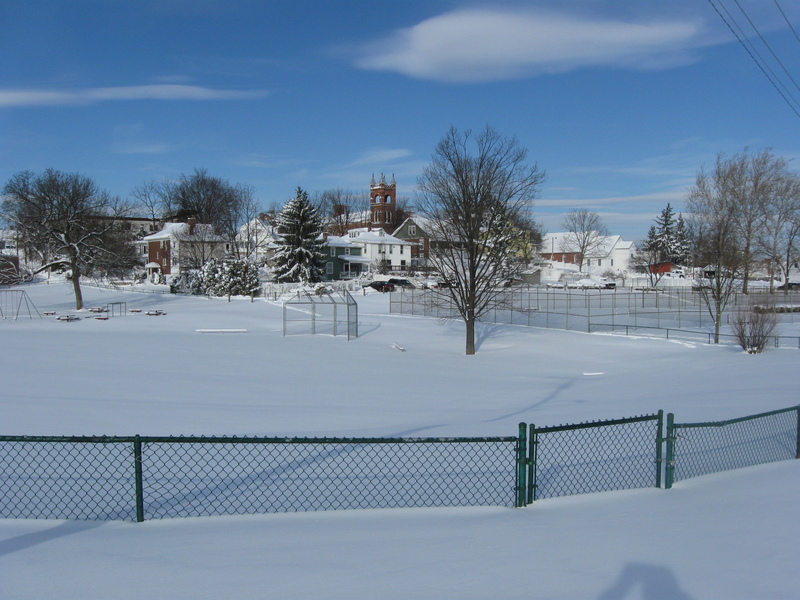 This view was taken facing southeast at approximately 12:00 PM on Thursday, December 24, 2009. 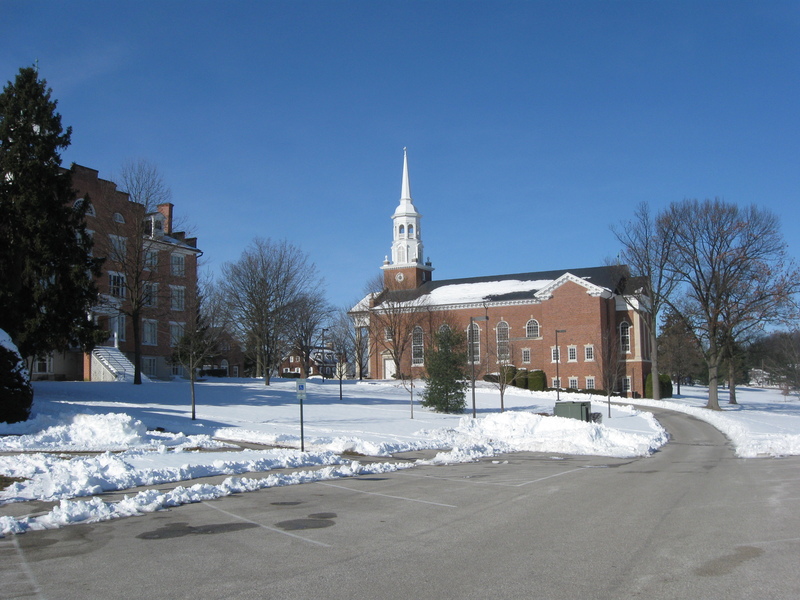 The driveway constructed as an exit for the parking lot runs below Schmucker Hall, and exits between Schucker Hall and the 1942 Church of the Abiding Presence (Seminary chapel with the tall white steeple) on Seminary Avenue/West Confederate Avenue. 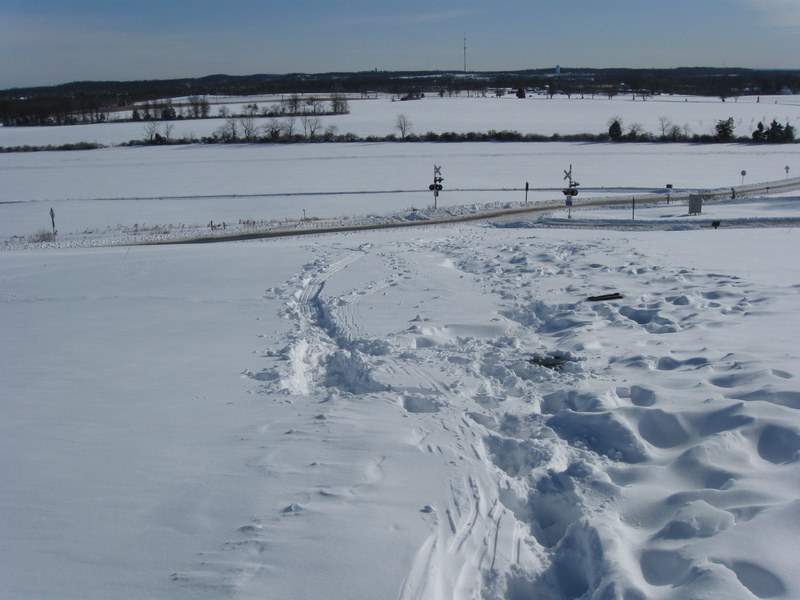 The sledders can’t cross the driveway and continue down the slope. This view was taken facing northwest at approximately 12:00 PM on Thursday, December 24, 2009. The attempts to beging sledding from the other (east) side of the driveway appear to be meager. This view was taken facing east at approximately at approximately 12:00 PM on Thursday, December 24, 2008. So the sledding has moved to in back of (east of) Valentine Hall. 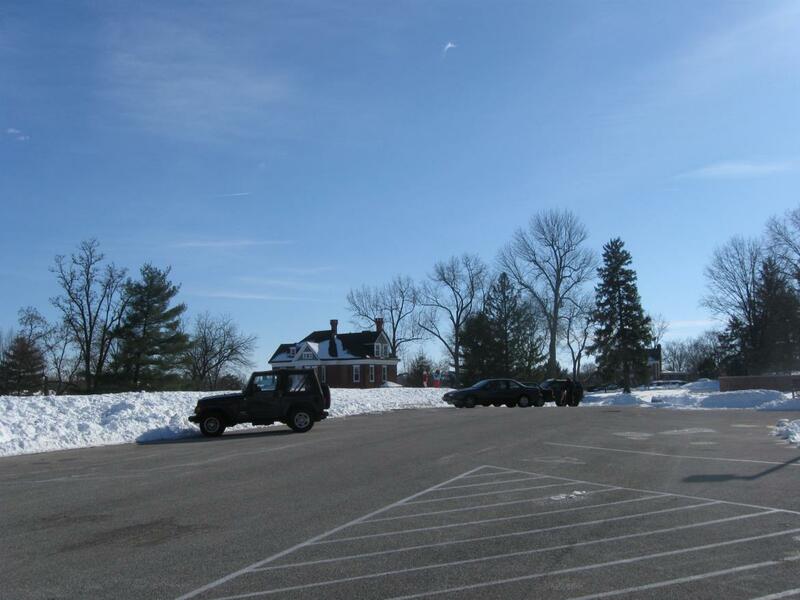 A berm “earthwork” was constructed here to hide the cars in the parking lot from those looking at the Seminary from the bottom of the hill near Hay Street. 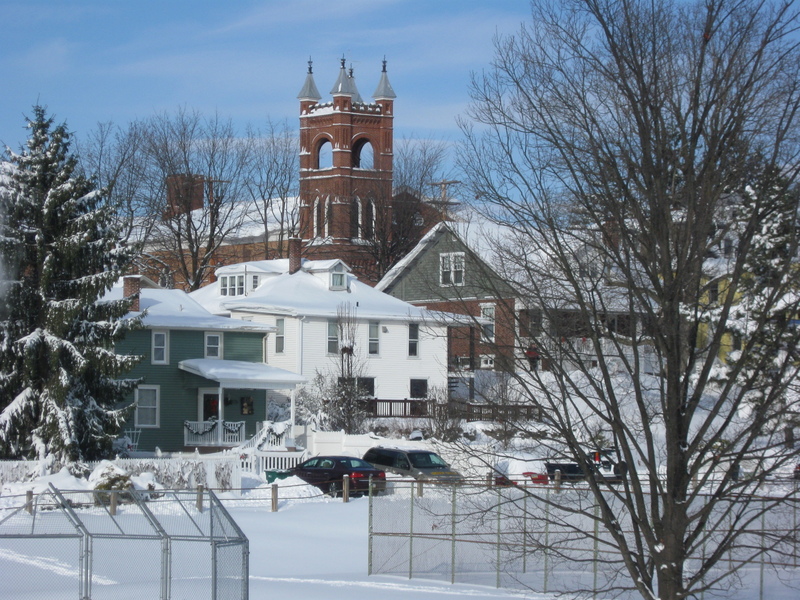 This view was taken facing southeast at approximately 12:00 PM on Thursday, December 24, 2009. This berm is now the “jumping off point” for the sledders. This view was taken facing southeast at approximately 12:00 PM on Thursday, December 24, 2009. In Video #3 A father and his daughter on an old wooden toboggan finally get a push with the son/brother holding on to the back. This view was taken facing southeast at approximately 12:00 PM on Thursday, December 24, 2009. We’ve moved farther south on the berm to look at the sledders as they begin their rides. The dark mass of trees in the background are on Oak Ridge/Oak Hill. This view was taken facing north at approximately 12:00 PM on Thursday, December 24, 2009. In Video #4 It appears the sledders were as concerned with running over each other as they were in reaching the bottom of the slope. This view was taken facing north to northeast at approximately 12:00 PM on Thursday, December 24, 2009. Finally we moved to the observation tower on Oak Ridge. This view was taken facing northwest at approximately 12:00 PM on Thursday, December 24, 2009. Oak Ridge used to be popular, but because of a change in the landscape, it is now longer as popular as it once was. This view was taken facing southeast at approximately 12:00 PM on Thursday, December 24, 2009. The planting of Oak Trees on the east slope has forced sledders to move farther north, and this area is less safe. 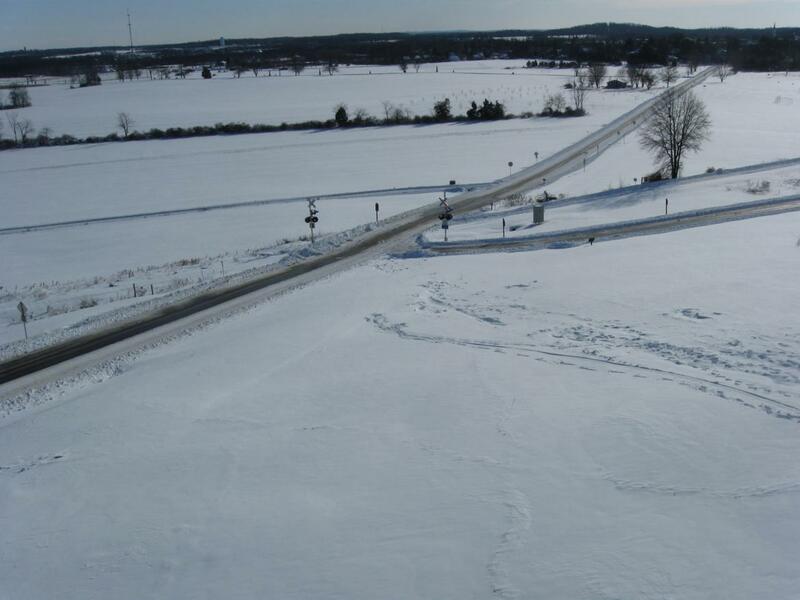 Cemetery Hill is in the center background, above the town of Gettysburg. This view was taken facing southeast at approximately 12:00 PM on Thursday, December 24, 2009. 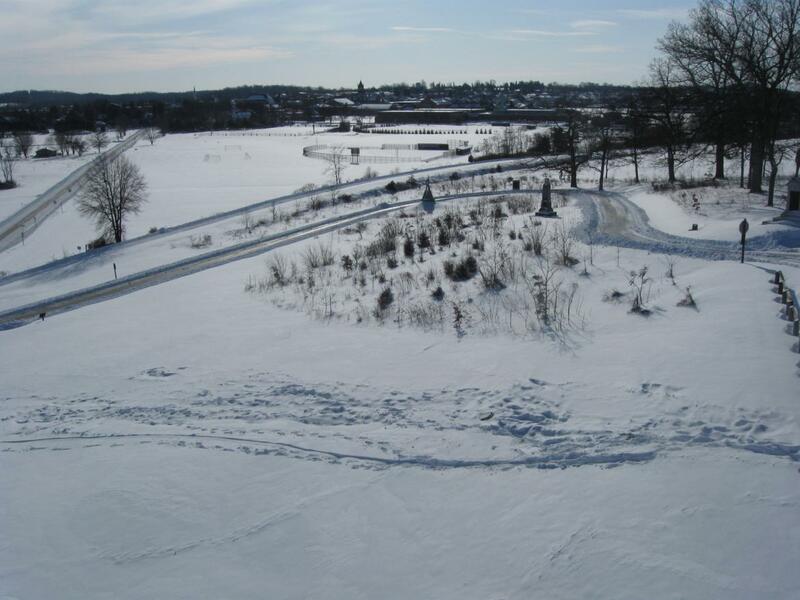 Sledders used to come fairly close to the 13th Massachusetts Monument. The red McClean Barn is in the right background. This view was taken facing north at approximately at approximately 12:00 PM on Thursday, December 24, 2008. Before the trees were planted, they could acquire so much momentum coming down the hill that they sometimes would… This view was taken facing northwest at approximately 12:00 PM on Thursday, December 24, 2009. …cross the little used Robinson Avenue until they came to rest at the railroad embankment on the right (southeast) side of Robinson Avenue. This view was taken facing north at approximately 12:00 PM on Thursday, December 24, 2009. 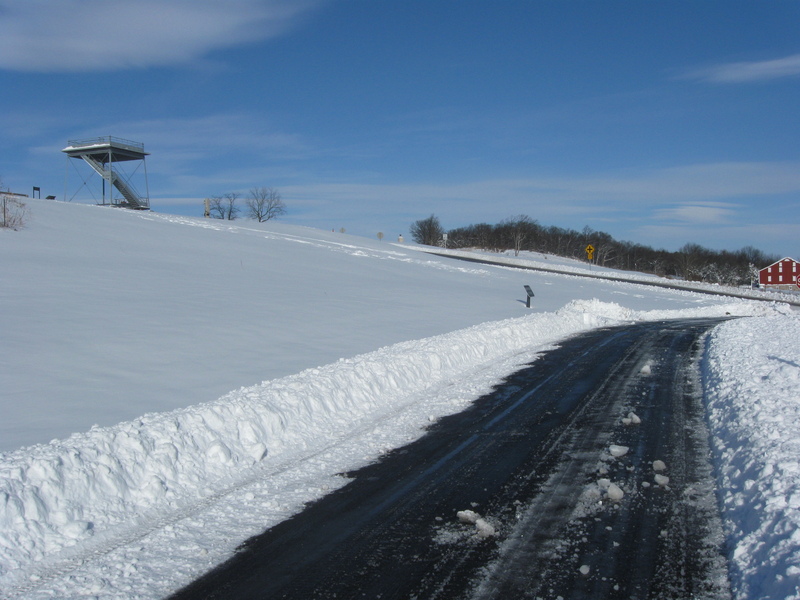 With the sledding area pushed farther to the north, a sledder with a lot of momentum could enter the dangerous Mummasburg Road, shown on the left. This view was taken facing southeast at approximately 12:00 PM on Thursday, December 24, 2009.